There was a brief period when Earl Grey tea of any brand was unavailable in our town – a situation that has fortunately been rectified. Feeling rather desperate for some, I was delighted to find this box of Closemyer Earl Grey tea lurking on a shelf in between organic herb teas, almond flour, and chai seeds among other items. Not having tried this brand before, I bought it. Naturally I boiled the kettle and eagerly opened the box as soon as I got home … and was assailed by a distinctly chemical smell! This smell was so pervasive that it permeated the tiny foil-wrapped tea bags. Each tea bag is so tightly woven so that it initially ‘floats’ on the water like a little buoy … not good news. Well, neither is the taste. I tried it out on family and friends. Verdicts (before even tasting the tea) ranged from “insecticide” to a “very bad cough mixture smell”. The brew itself is pale, thin-tasting, and distinctly artificial. What ingredients would you expect to be listed on an average box of Earl Grey tea? Apart from a black tea base, surely you would expect to find bergamot? Bergamot being oil from the rind of bergamot orange. Given the history of tea, the Chinese are generally credited with having first developed scented and different flavoured teas. 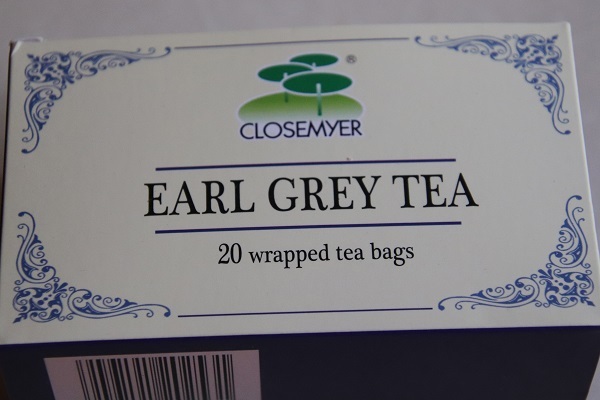 As Closemyer Earl Grey tea is a product of China – surely it would be a top class tea? I’m afraid not. We all know that the citrusy flavour of Earl Grey comes from the addition of natural or synthetic bergamot oil – the problem with the Closemyer version is that it is overwhelmingly synthetic in smell and taste. 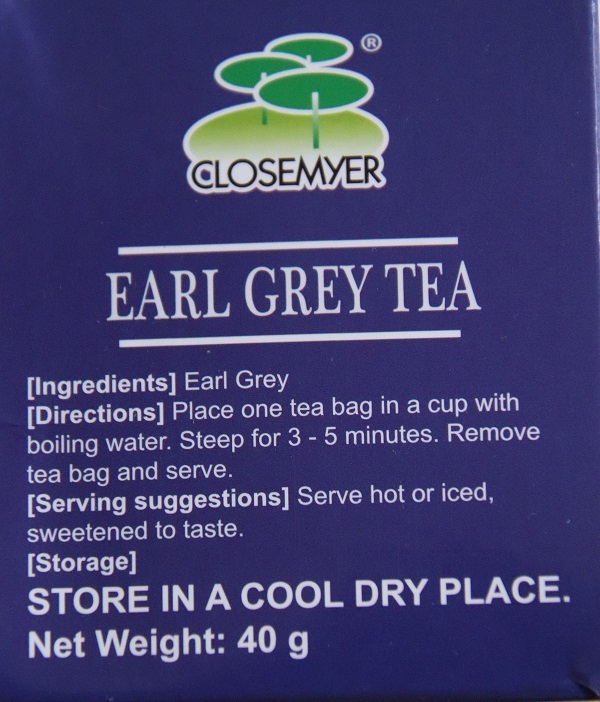 So synthetic in fact that the ingredients are simply listed as … Earl Grey tea! Reluctant to waste good money, I have valiantly imbibed several cups of this tea – with and without milk. The tea is not to be recommended and so I have finally succumbed to the fact that as it brings me no pleasure, the rest of the bags have simply had to be binned. My collection of teas is dwindling, mainly because we haven’t travelled anywhere ‘tea-worthy’ for some time. 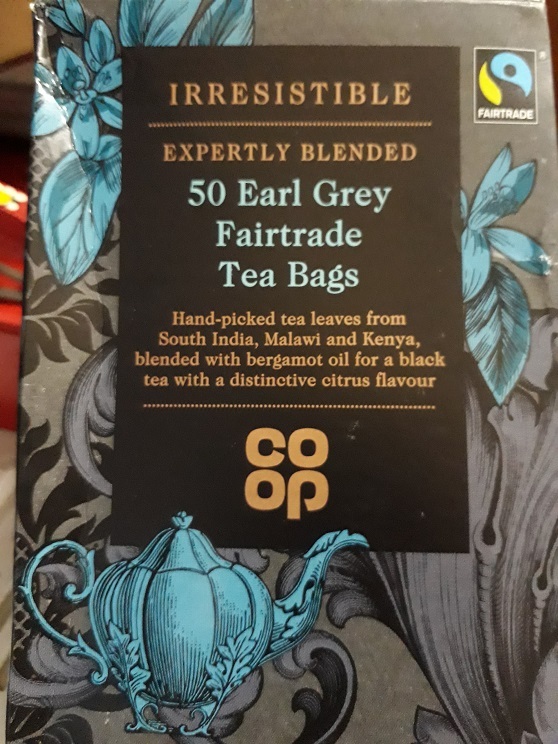 It thus came as a lovely surprise when a friend invited me to tea and opened her box of Co-op Earl Grey Fairtrade tea bags that she had received as a gift. Fairtrade is a word that has become synonymous with ethical products. To quote from the box “Fairtrade means fairer trading conditions and opportunities for producers in developing countries to invest in their businesses and communities for a sustainable future.” It is also stated on the box that the leaves come from strictly monitored plantations – which includes the monitoring of employee working conditions. Good for the conscience that. We are always up for something new, and while this may be a supermarket brand in the UK, it is an ‘exotic’ brand to us. The blue and grey packaging with the sketches of leaves, flowers and an old-fashioned teapot appealed to us both. While there is nothing new in the ingredients – we assumed the ‘natural ingredients’ referred to was the bergamot – it is always interesting to taste the different combinations of teas blended by different manufacturers. We know that both Malawi and Kenya produce delectable teas in their own right, so the truly ‘exotic’ part of this tea would be the addition of leaves from South India. We sat outside, enjoying the warm breeze of a late autumn afternoon, savouring both the warmth and the taste of the tea. It is delicious: we enjoyed the full flavour of slightly smoky black tea infused with oil of bergamot. A calming drink, it was the perfect backdrop to a wonderful afternoon of catching up and enjoying each other’s company. As this tea is not available in this country, we made the most of it – and poured another cup! In April last year I mentioned that I had been introduced to Earl Grey tea whilst on a visit to England (see THE TEN VIRTUES OF TEA) and in January this year that it has since become a staple offering in my home (see TIME FOR TEA). It was my English aunt who introduced me to Earl Grey. On my first visit to her lovely cottage tucked away in the then small village of Bradford Peverell, she brought a silver teapot, fine china cups and slices of fruit cake to her pretty garden. The aroma was arresting. The look of the pale milky fare was not enticing at first. The taste with its Bergamot flavouring, however, had me hooked for life – even more so when I was able to make a slightly stronger brew, which brought out a bolder flavour. 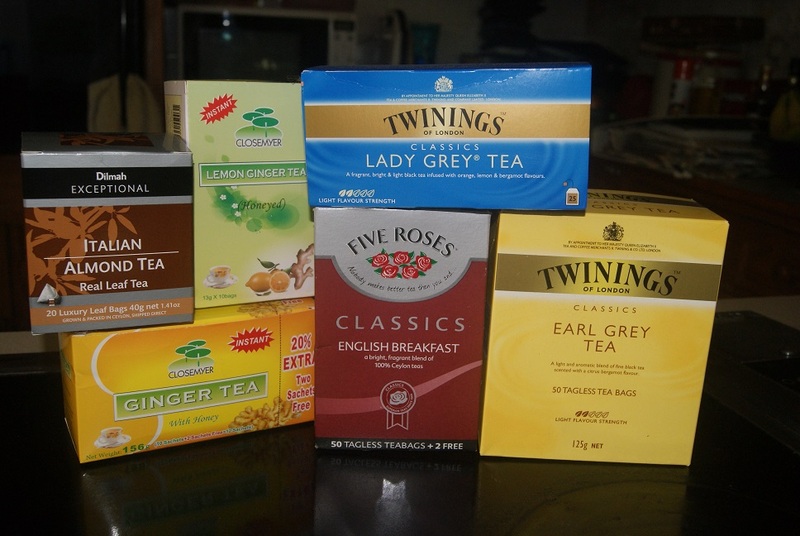 At first, Twinings was the only variety of Earl Grey tea I could lay my hands on. Eyebrows would rise when I would put six or more boxes into my trolley when shopping in Johannesburg (it has always been more expensive than other teas). I had to. We were living in Mmabatho at a time when it was still a city-in-the-making. Purchasing anything but basic foodstuffs there was but a dream then. Whenever I brew a pot of Twinings Earl Grey – more especially when I can use loose leaves – I think of my English aunt, her pretty English garden where a robin would regularly perch on the edge of the plate on the tea tray to peck at the crumbs, and of her tiny doll-like house. She will turn 90 next year. With the Rand in a dizzying downward spiral, we have to look to local products if we want our ‘fix’. Liptons Earl Grey is firmly associated with camping in the Kruger National Park and the Kgalagadi Transfrontier Park, for my dear sisters-in-law make sure to bring some along. They know me well. 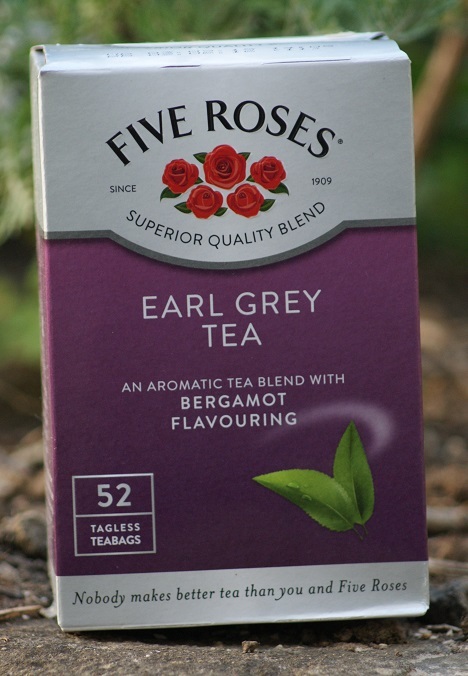 At home I mostly use Five Roses Earl Grey tea for it is readily available at our local supermarket. Earl Grey is traditionally served black as an after lunch tea. I still enjoy it with a splash of milk at any time of the day as it is always refreshing and is a real pick-me-up, soothing variety of tea. As a point of interest, this tea blend is named after Earl Charles Grey, who was the English prime minister from 1830-1834. He was also known as Viscount Howick from the Northumbrian seat of Howick Hall – I wonder if the town of Howick (and the waterfall of the same name) in KwaZulu-Natal is also named after that family? It is well known that at whatever time of the day you arrive at my home, you are bound to be offered tea. Equally well known is that I seldom offer the same tea twice in a row and will always tell you what tea you are drinking – most visitors can only tell if it is not ‘ordinary’ tea. If you are not partial to it, there are plenty of other varieties to choose from – I will not be offended. I have been blessed with gifts of tea and generally spy out the shelves of any supermarket away from home. Residents in most other towns enjoy a wider variety of teas to choose from than we do.Thus, I returned from Cape Town armed with vanilla tea and orange pekoe. My supply of lapsang souchong has been topped up; we have tried Twinings Liquorice Allsorts tea; and B brought round a box of really delicious Dragonmoon tea, which we have enjoyed on several occasions. Today was as good as any to clear the shelves and fill up the recycling bag for the next collection. The boxes that have accumulated over the past few weeks is a small indication of the teas we have consumed of late. The powdered ginger teas make pleasant cold-weather drinks. These boxes were dipped into during the winter and finished during the long spell of inclement weather leading up to the New Year. Twinings Earl Grey tea is a staple offering – alongside the Five Roses and Liptons varieties, with Lady Grey a pleasantly fruity alternative. Earl Grey with blue flower is also a pleasant change. Breakfast tea is always appreciated for its full-bodied flavour and strong colour. A rather special tea we have enjoyed is Dilmah’s Italian Almond Tea, a gift from C. While it is delicious on its own, for those who find the almond flavour too strong I mix it with a bag of Ceylon tea – also a very pleasant cuppa indeed! I was comfortable sitting in the shade of the forested part of the garden. The Cape– and Village Weavers were pecking away at the seed I had scattered earlier and would, now and then, latch onto a large (for them) piece of bread and fly up to a nearby branch to consume it at leisure. My pot of Earl Grey tea was nearing its end when I turned my attention to the Forktailed Drongo up to its usual antics of stealing titbits from the beaks of other birds. It was good to hear the Sombre Bulbuls calling nearby; the Laughing Doves were combing the lawn for seeds and I idly watched Bryan the tortoise amble along, munching as he went. It was an idyllic scene. The unusually persistent calls of the Cape Robin had barely registered in my languid state until the calls seemed to become louder and more agitated. I realised they came from the thick foliage near the pool, but was too comfortable to investigate – until I noticed the weavers, the Olive Thrush and the Forktailed Drongos swiftly fly towards the sound. As I approached the pool, I noticed a flurry of feathers as the afore-mentioned birds flew in an out of the leaf cover, all flapping their wings and making a loud noise. I looked up at the leaf canopy from underneath in time to see a large Boomslang winding itself sinuously through the branches. As it looped across towards another tree, the slack, thick cable of its body was repeatedly attacked by robins, weavers, a Black-collared Barbet and even a Speckled Mousebird. The snake moved swiftly and gracefully, winding in and out of the branches with ease towards a shallow nest balancing precariously in a fork of cotoneaster branches. Neither the mobbing of the birds nor the cacophony of their protests seemed of concern. I turned away to call P to witness what was happening. My attention was diverted for seconds only … the Boomslang disappeared! As you can imagine, I checked the draping stems of canary creeper very carefully before moving an inch. The agitated birds began to disperse and soon all was quiet. The soporific air of a hot afternoon reasserted itself. Cape White-eyes resumed their search for insects, the weavers returned to the seed tray, the Laughing Doves tramped across the lawn, and the Cape Robin – which had alerted me to this drama – flew off towards the direction of the fig tree.